NHL News : Kings pushing three players on trade block to get immediate help! Kings pushing three players on trade block to get immediate help! Is the panic button being pushed in LA? It seems almost obvious that the Kings are in dire need for offense and speed up front, and Blake should start looking at what he can give up to acquire these much needed qualities. 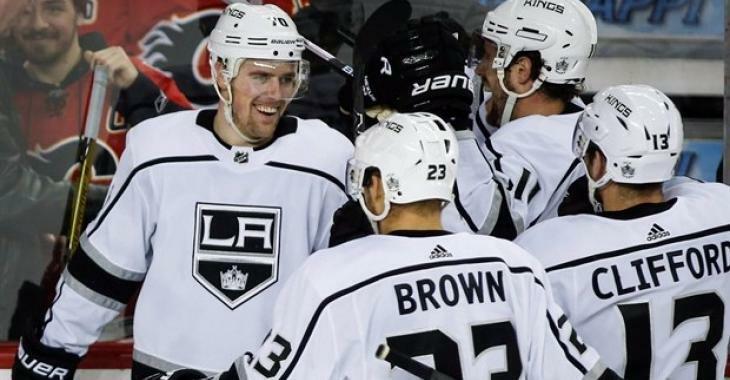 According to the Fourth Period editor in chief David Pagnotta, there has been internal chatter in LA over futures of left wingers Kyle Clifford and Tanner Pearson. While pointing out that nothing is imminent at the moment, Pagnotta pointed out that trade talks could pick up if the Kings can’t get it together soon. Head coach John Stevens has been the first to be blamed for the Kings’ poor performances over the past week and may be landing on the hot seat, however, Blake might look to motivate his players by landing some speed up front and making a statement with a major trade. The loss of Clifford or Pearson could really send a message and give the Kings the push they truly need to return as a true contender. On top of that, TSN’s Darren Dreger believes Alec Martinez could also be used as a trade bait. “There’s been speculation around Alec Martinez as a trade possibility but I think that Blake needs his best players to be better first before he does anything drastic,” said Dreger on TSN’s Insider Trading. We are pretty sure Blake is making phone calls to see if there is interest for Pearson and/or Clifford, and also study what type of return he could receive to help him team immediately.